The artefacts show that our earliest human ancestors colonised East Asia over two million years ago. They were found by a Chinese team that was led by Professor Zhaoyu Zhu of the Chinese Academy of Sciences, and included Professor Robin Dennell of Exeter University. The tools were discovered at a locality called Shangchen in the southern Chinese Loess Plateau. The oldest are ca. 2.12 million years old, and are c. 270,000 years older than the 1.85 million year old skeletal remains and stone tools from Dmanisi, Georgia, which were previously the earliest evidence of humanity outside Africa. The artefacts include a notch, scrapers, cobble, hammer stones and pointed pieces. All show signs of use – the stone had been intentionally flaked. Most were made of quartzite and quartz that probably came from the foothills of the Qinling Mountains 5 to 10 km to the south of the site, and the streams flowing from them. Fragments of animal bones 2.12 million years old were also found. The Chinese Loess Plateau covers about 270,000 square kilometres, and during the past 2.6m years between 100 and 300m of wind-blown dust – known as loess – has been deposited in the area. The 80 stone artefacts were found predominantly in 11 different layers of fossil soils which developed in a warm and wet climate. A further 16 items were found in six layers of loess that developed under colder and drier conditions. These 17 different layers of loess and fossil soils were formed during a period spanning almost a million years. 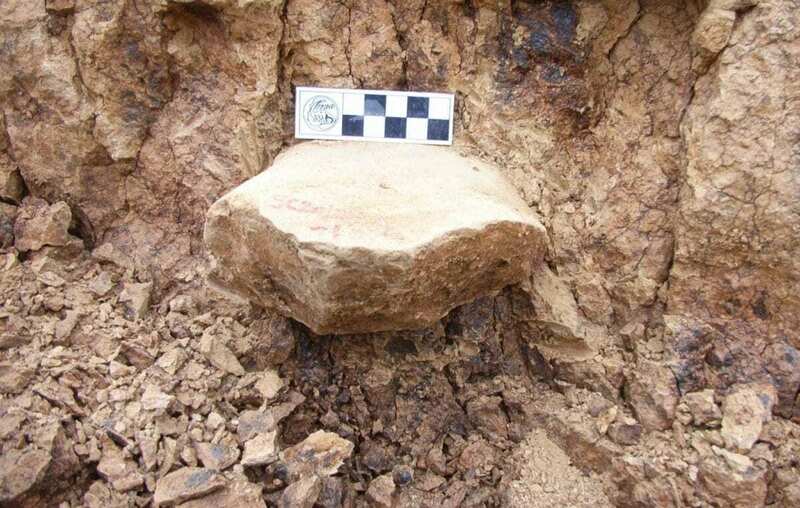 This shows that early types of humans occupied the Chinese Loess Plateau under different climatic conditions between 1.2 and 2.12 million years ago. The layers containing these stone tools were dated by linking the magnetic properties of the layers to known and dated changes in the earth’s magnetic field. Professor Dennell said: “Our discovery means it is necessary now to reconsider the timing of when early humans left Africa”.